Quick Key is an excellent platform for creating and conducting formative assessments. I often include Quick Key in my presentations about formative assessment because it is a tool that works equally well in classrooms that are 1:1 and in classrooms that are not 1:1. This is possible because Quick Key allows you to create formative assessments that you can distribute electronically as well as on paper. If you use Quick Key to distribute your assessments electronically, Quick Key will score your students' responses automatically. 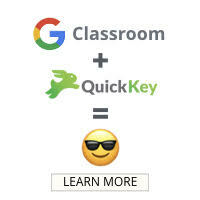 One of the latest features of Quick Key is an integration with Google Classroom. This integration lets you use your Google Classroom rosters to distribute and collect assessments. If you distribute your assessments on paper, you can use the Quick Key mobile app to quickly scan your students' answer sheets and receive the scores. Watch the following teacher-produced video to learn how easy it is to use Quick Key to score formative assessments.